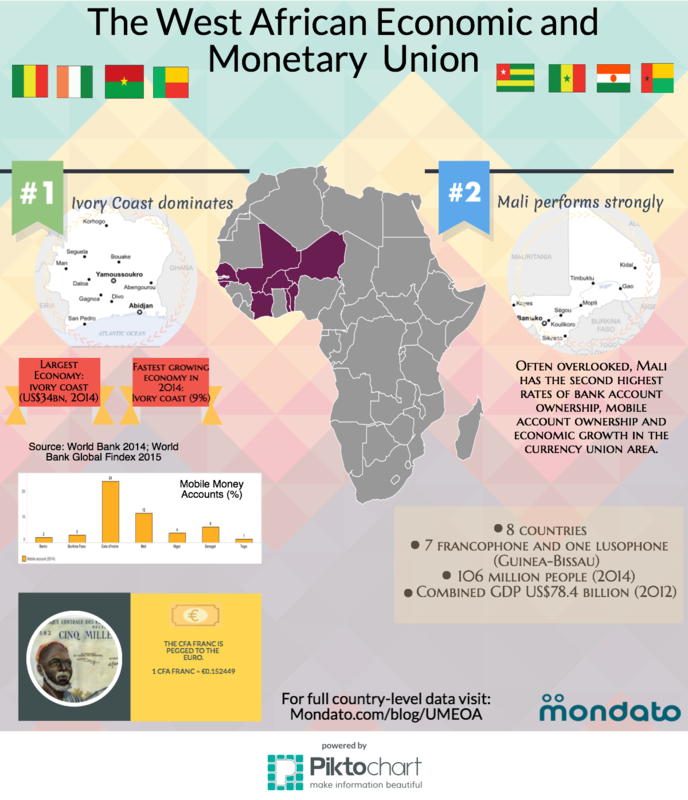 The West African Economic & Monetary Union: Ready For The Big Time? Along with other commentators in the space, *Mondato Insight *has frequently observed the importance of the regulatory framework to the growth of mobile money within a particular jurisdiction. The limitations of regulation, or rather the importance of other additional factors, however, can be demonstrated when multiple countries share the same e-money regulations. This is precisely the case in the group of eight West African countries that commonly share the West African CFA Franc (Benin, Burkina Faso, Guinea-Bissau, Ivory Coast, Mali, Niger, Senegal and Togo). Although this collection of seven former French colonies plus Guinea-Bissau share one currency and have one central bank that regulates e-money, the popularity of mobile wallets and other components of the ecosystem varies enormously among its more than 100 million people. From the shining mobile money success story of Ivory Coast to the e-wallet desert of Togo, the members of the West African Economic and Monetary Union (better known by its French acronym, UEMOA) serve as a useful reminder that a relatively enabling regulatory environment is a necessary but not adequate condition for the growth of mobile financial and other mobile services in developing markets. The governing regulatory authority for mobile and other financial services in UEMOA is the Central Bank of West African States (BCEAO in French). A relatively early adopter of specific regulations, back in July 2006 BCEAO issued instructions relating to the issuance of e-money, and clarifying its position as the sole authority responsible for the issuance of licenses to mobile money issuers. The instructions drew a distinction between e-money issuers, which had to be banks or other prudentially supervised financial institutions, and e-money distributors that were non-bank entities (such as MNOs) that distributed – but did not issue e-money – to customers. A third entity, non-bank e-money issuers know as e-money companies, proved not to be popular across the eight jurisdictions. This regulatory framework created an ecosystem in which MNOs led mobile money deployments as e-money distributors, backed by partner banks that operated as the e-money issuers. Despite (though there are surely those who might argue because of) the early implementation of a specific regulatory framework for e-money across the monetary union, for many years, adoption and usage rates were sluggish, where they registered at all. Partly as a result of civil strife, even in UEMOA’s top mobile money market, Ivory Coast, the number of registered mobile money users remained relatively depressed, before seeing a massive 150% increase in registrations in 2012 and the first half of 2013 that meant that by the summer of that year over half the unique GSM subscribers in the country were also registered mobile money account holders. This, however, has to be contrasted with others in UEMOA, such as Mali, for example, which although it has the second-highest mobile account ownership in the union, barely 12% of its adults in the country have a mobile money account, half the rate of its Ivorian neighbor. Nevertheless, this is still double the third-ranked nation, Senegal. With the exception of impoverished Niger (data was not available for Guinea-Bissau), according to the World Bank Findex, the other six countries in UEMOA had bank account ownership rates of around 15%-20%. Ivory Coast, by comparison, as well as having the highest mobile money usership, also has the highest number of banked citizens, at over one third of the population over the age of 15 in 2014, a rate over twice as high as in Senegal (15%). Significantly, however, the region’s mobile money laggards, Togo, Benin and Burkina Faso, with 1%, 2% and 3% respectively, fared as well as, and in two cases better than Senegal, when it came to bank account ownership. This would suggest that although a lack of financial inclusion is not a good predictor of mobile money popularity, a more developed banking system, and UEMOA’s most vibrant economy, can provide an important basis upon which to build MNO-led mobile money deployments. The Findex figures for Benin in particular must have been disappointing for those working in the financial inclusion sector, where barely 1% of adults are mobile money users (though with around eight times that number in possession of m-wallets). Nevertheless, attention of late has been turning to Benin, and neighboring, and smaller, UEMOA member Togo. Despite being in the very early stages of the development of the mobile financial services ecosystem in the country (see above), many observers believe that the mobile and digital ecosystem in Benin is about to begin accelerating its growth of mobile money adoption, usage and use cases. Indeed, when late last year *Mondato Insight *spoke to MTN Group’s then CCO, Peter Verkade, he surprisingly tipped Benin as the hot market to watch for 2015. In addition to MTN Benin’s own efforts coming to fruition, as they did after a period in Ivory Coast, it is likely that part of Mr. Verkade’s confidence in tiny Benin becoming a mobile money hotspot in the near future was the knowledge that 2015 would see new, updated, e-money regulations emerge from BCEAO. These were finally issued at the end of May this year, and while not perfect (e.g. there is no provision for interest to be paid to customers), they mark an improvement on the almost decade-old former regulations. The new rules provide clarity in multiple areas, and emphasize specific obligations as they relate to holders of the different e-money license types. Most significantly, however, BCEAO appears to be trying to significantly shake up the dominant bank-MNO mobile money partnership model, and have MNOs take up new e-money issuer licenses that would bring them under the direct supervisory gaze of BCEAO. Such a move would not be unwelcome among many of the MNOs working in the common currency area, who have experienced similar issues in their partnerships as were faced by telcos in Ghana: banks owned the customer and the product, while MNOs were the face and driving force behind mobile money. As e-money issuers, MNOs will be able to launch standalone deployments without the need to have a bank standing behind them, although they will still need a partner in order to provide credit services to their customers. The new e-money regulations have the potential to affect almost 110 million people in 8 countries, and could well prove to be an important catalyst to drive up mobile money usage in countries such as Benin, that are substantially poorer than Senegal or Ivory Coast. 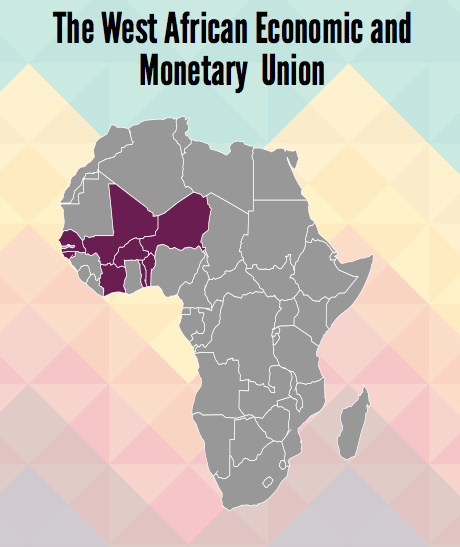 And although interoperability has not been mandated by BCEAO in the rules (though e-money issuers need to ensure that it is not technically impossible), the UEMOA bloc has seen important and significant advances in the opening of international mobile money remittance corridors. At the end of 2014 MTN opened up a new corridor between MTN wallet-holders in Ivory Coast and Benin itself, after a successful initial linkage between MTN Ivory Coast and Airtel Burkina Faso. Orange has already linked its wallets in Ivory Coast, Mali and Senegal, and is likely to further expand in the future, while Moov has established mobile remittance corridors that connect Ivory Coast, Benin, Togo, and Niger. With a common currency and regulator, it is likely that we will see the full integration of interoperability across at least 7 of the 8 jurisdictions in the not too distant future. 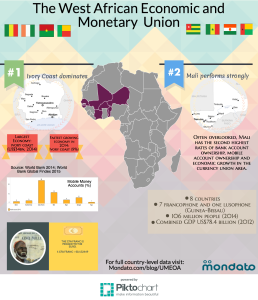 The new e-money regulations issued for the constituent countries of the West African Economic and Monetary Union come hot on the heels of a revamped regulatory environment in Ghana, an anglophone mobile money trendsetter that is surrounded by the ocean on one side and UEMOA members on the other three. The second generation mobile money deployments that will develop from these two separate, new regulatory regimes will provide interesting and useful insights and points of comparison that may well make the region a laboratory for experimentation and growth in mobile financial services. After almost a decade of being overshadowed by the mobile money sprinters of East Africa, has the time finally arrived for mobile financial services to bloom all along the Gulf of Guinea and the Bight of Benin? Click to enlarge or click here for interactive version with full country-level data. Image: some rights reserved, Mondato LLC 2015. CC BY-NC-ND 4.0.